Hotzones offer an experience bonus higher than that of regular zones. Some of the latest sets also have extra loot added; this loot is obtainable even after the zones are no longer "hot." In addition to the experience bonus and special item drops listed below, you can also see Franklin Teek (map) in the Plane of Knowledge for a series of level-based "Simple Tasks" to be completed in current hot zones. These tasks result in some extra experience, armor and coin. In fact the hotzones rotate since this date with every patch regardless the time between the patches. The three possible zone sets are listed below. Visit Franklin Teek in the Plane of Knowledge to see the current list of hotzones, grab a task, and get adventuring! Note: Here are the lists of the possible hotzones instead of adds after each change (patch). Players, please talk in game to Franklin Teek in PoK to see which ones are active. They randomize every day per server. Skal Nethus (map -- location -320, 1200, -111 in the Plane of Knowledge -- near Franklin Teek) offers a task called "Udumbara, the flower of legend" that involves every hotzone and results in the augmentation Udumbara. Skal Nethus (map -- location -320, 1200, -111 in the Plane of Knowledge -- near Franklin Teek) offers a task called Skal's Walking Nightmare that involves killing a mob from each one of these hot zones, resulting in The Sum of Skal`s Nightmares. 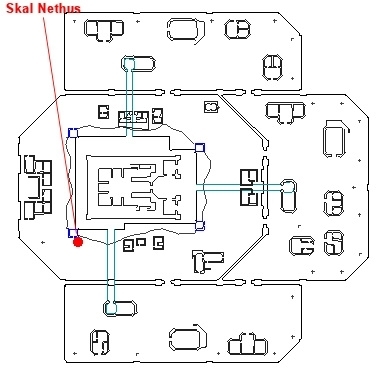 Skal Nethus (map -- location -320, 1200, -111 in the Plane of Knowledge -- near Franklin Teek) offers a task called "The Dungeon Rot Infected" that involves returning an item from each one of these hot zones, resulting in Purified Dungeon Rot. Skal Nethus (map -- location -320, 1200, -111 in the Plane of Knowledge -- near Franklin Teek) offers a task called "The Escaped Voidsouls" that involves returning an item from each one of these hot zones, resulting in Gem of Bound Voidsouls. Franklin Teek has arrived in the Plane of Knowledge just East of the Guild Lobby and will be happy to point you to the current location of a Hot Zone appropriate for your level. Franklin also has a series of tasks that can be done in each of the current Hot Zones. You can only request a single task at a time. Once one task is completed, there is an 18 hr lockout from the time the task was requested until another task can be requested. Each level task objective changes each day, so if you request one today, the objective tomorrow will be different. As an example, A Simple Task - Level 20 was Kill 5 Goblins on Wed Aug 20, 2008, Kill 5 Sabertooths on Thu Aug 21, 2008, and Kill 5 Iksar on Fri Aug 22, 2008. Here's a complete list of all the hotzone drops for the last set of hotzones. These are actually mini-quests that start whenever you loot an item. They revolve around Aiden Silverwing, who is in PoK near the Guild Hall zone-in. The general idea is that he gives you a Silverwing Lockbox, in which you combine the Random Drop from one zone with the Shard Combine, which drops from the next higher hotzone. So, for each hotzone, VWDiesel has listed the random drop, the augmentation, the shard combine (which drops in the next higher hotzone), and the melee and caster items that result once you combine the shard and the random drop. The last hotzone, Halls of Honor, randomly drops the melee or caster item, with no shard to combine. When you've completed all these quests for each hotzone, there is a final item you can make if you combine each of the hotzone melee or caster items in the Silverwing Lockbox. Those are listed at the bottom under "Final Combine". Thanks again to VWDiesel for the information. All items (except augments) come from quests given by James the Watchmaker. These quests involve getting three gears and a sprocket from each zone that was hot during this time frame, and returning them to him. You do not need to have the quest before you get the turn-in items. Rewards vary by level. Additionally, each zone has 4 new NPC nameds that drop more level appropriate gear than the rest of the zone. I do not have a complete list of nameds and items, however, there is a nearly complete list here, at EvilGamer in this post. These hotzones have minor(by todays standards) loot upgrades added with new mobs, and new global rare drops, however, they do not have any Augments (except Skyfire) that drop in these zones. This page was derived in large part from a thread found in one of our eq forums. The original thread can be found here. This page last modified 2019-04-04 08:02:14.